I did it! (I think) I finally made a believer out of Chris! (Mostly) Chris finally ate some eggplant and didn’t think it was (very) terrible and gross! Yay for Chris! Yay for me! Yay for you! Yay for eggplant! 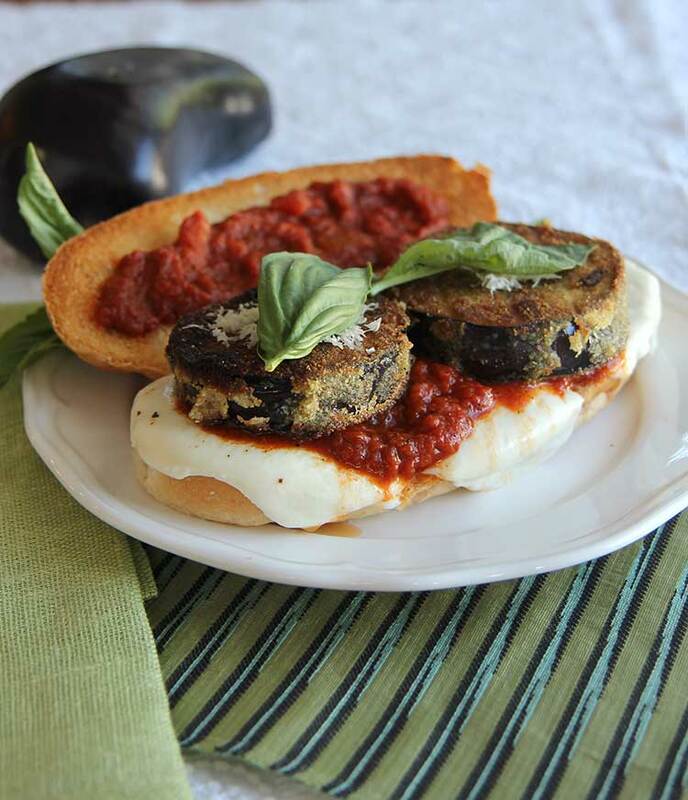 This eggplant parmesan sandwich is a great way to use eggplants while they’re in season. Adapted from my Learn to Cook book, I added a breadcrumb coating here to make sure the sandwich has plenty of crunchy texture. If you don’t want a big ol’ slab of bread involved in your eggplant parm, just place the fried eggplant slices on top of some marinara sauce in a 9×13″ pan, top with mozzarella and a little more sauce; bake at 350 for about 10 minutes until melted and bubbly. This way, it can be served on its own or with pasta and a salad. And if you love eggplant parm as much as I do, you’ll also enjoy eating leftover fried eggplant parmesan slices cold from the fridge, dipped in marinara. Slice eggplant crosswise into 1/3″ slices. Pat dry. Whisk eggs and flour together in a shallow bowl. Combine crumbs, seasonings in another shallow bowl. Dredge eggplant slices in egg mix, then breadcrumbs. Lay on a rack to “dry” at room temperature 10-30 minutes. Meanwhile, slice rolls open and place on baking sheet. Lay two slices cheese on half of each and put into 200ºF oven to melt cheese and warm buns. Heat 2 tablespoons oil in a large skillet over medium heat and fry eggplant slices in a single layer about 3-5 minutes on each side until golden and tender. As slices are cooked, drain on a rack and sprinkle with Parmesan while still hot. Cook remaining eggplant, adding a little more oil if necessary. Once all slices are cooked, drain all but 1 teaspoon of oil from the skillet and CAREFULLY add sauce to skillet and heat to bubbling. 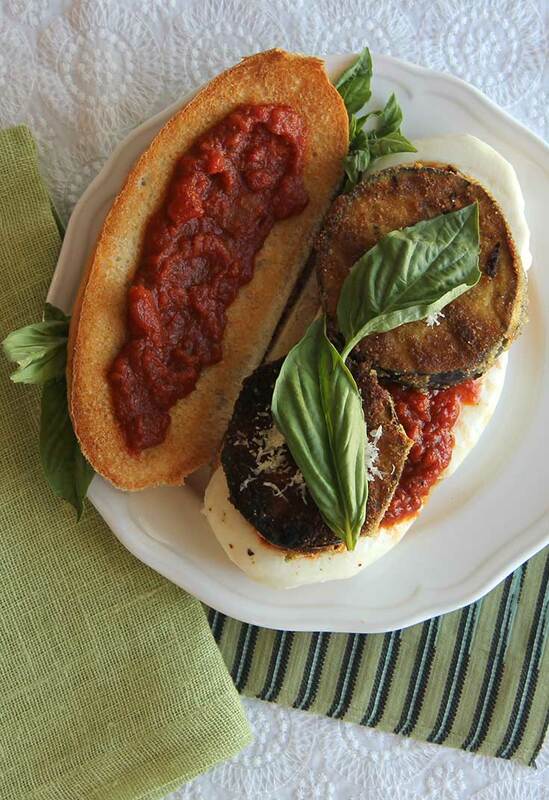 Remove rolls, top cheese with eggplant slices and sauce and fresh basil leaves. This would work well with zuccini as well. Maybe hubby has never had eggplant that was prepared properly? Eh, he’s had it many different ways. This he thought was pretty okay, and I think that’s as much as I can hope for! If you want to try him on a second recipe, I made Pasta Alla Norma My Way, from the NY Times recipe site, a couple weeks ago and it was fab, too. No large hunks of eggplant that he might have a texture issue with. Thanks, Gigi! I’ll look for that. I am so glad that you don’t do the ‘salt soak & rinse’ with the eggplants; I don’t either. 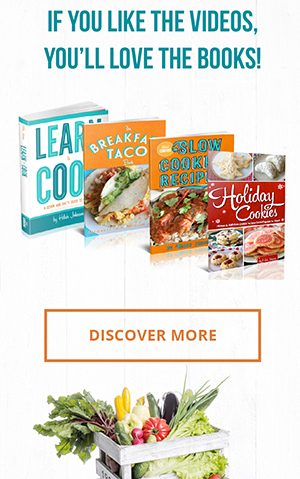 So many recipes tell you to do it and I did once. I didn’t notice any difference at all and it was just an annoying waste of time. I Love your videos! I’ve always been told to soak my eggplant in water or milk to take out bitterness. Is this true or does it make a difference? I’ve only made eggplant a couple of times and it seem to tough?? Interesting. I have never heard of that, Amy. I’ve only heard to salt the eggplant slices and let them sit for 20 minutes or so to draw out some of the moisture and the bitterness, but I don’t notice a difference. That is weird that your eggplant would be tough. The skins are kind of tough, so maybe peel yours before you slice it. But eggplant gets really soft when you cook it, almost creamy textured. 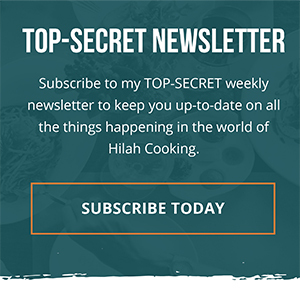 As I say in my comment to Hilah below, I’m a male human being who has always loved egglpant. Many memorable experiences in Turkey. Turkish recipes often ask the cook to peel the eggplant lengthwise, in strips, so that the eggplant ends up with alternating stripes, peeled and un-peeled. That way, even if the skin is tough, it’s in small pieces after you slice the eggplant. Don’t know whether this will be of any help to you. Just for what it’s worth, I’m a male human being, and I’ve always loved eggplant. I have a Chinese friend who says that, in Chinese, it is sometimes referred to as “chicken without (a) head”. Many of my favorite preparations are Turkish and/or Middle Eastern. Probably my absolute favorite is “hunkar begendi”, literally “sultan’s delight”, a purée similar to baba ghanouj except that it has some butter and cream in it instead of tahini. It’s always served with a rather spicy, tomato-based lamb stew. I hope the pregnancy is going well and that your son will be healthy and happy. Forgot to mention: “Hunkar begendi” also includes “hard, mature” grated cheese. In my experience Locatelli pecorino romano works well. 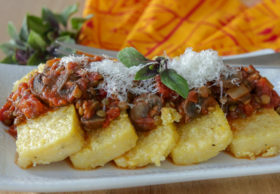 Even though I’m not a big lover of eggplant (but not a hater, either), I’m dying to make this. 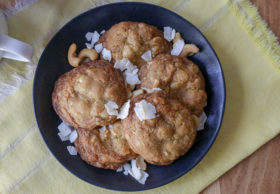 Frying makes just about anything taste good! Even okra (I am to okra as Chris is to eggplant). I’m glad you mentioned eating it cold from the fridge, because I don’t think doing the old cook for one freeze the rest strategy will work for fried eggplant. I’m curious to know if you considered putting the cheese on the top bun. As a few of the above commenters suggest, eggplant is very favored in non-USA dishes. Eggplant parmesan is an Italian dish; so is caponata. Baba ghanoush is a Middle Eastern dish. Ratatouille is a French dish. Americans can be so fussy (sorry, Chris!). Here is my panko-crusted oven-fried eggplant. There is an Ladino song about the superiority of the eggplant. (Ladino, sort of an amalgam of Spanish and Hebrew, is the ancient language of Spanish Jews.) In “Pleito del Źarźavat,” an eggplant and a tomato debate over which is superior. The tomato boasts that, as an ingredient in meals, it it is praised. The eggplant, one of whose advantages in the pre-modern kitchen was its long, nonrefrigerated shelf life, says, “Kayada state, tu tomat! Ke no valez metalik. Ke dos diaz en el sesto, lo k’aprestas para’l isierko!” (“Shut up, you tomato! You aren’t worth a plugged cent. Two days in the shopping basket and you’re off to the garbage!”). The tomato responds that everyone uses tomatoes. The eggplant answers that IT that it is fried only in the most expensive olive oil bought by the best people. “Mi kumida es alavada i mijor ke el tomat” (“My dishes are greatly praised and better than a tomato’s!”). As you may already know, Penelope Casas, in her first cookbook from thirty years ago, gave a Spanish recipe for eggplant baked with shrimp in a cream sauce. Definitely trayf, but, sorry, I don’t know the Ladino word for anti-kosher. I have been in Sicily. Grilled tuna or swordfish with caponata is ambrosia, and potentially very correctly kosher. Haha! And eggplant, too. It’s a vegetable even if it is battered and fried! 😛 Enjoy it, Beth Anne! A. I’ve never done that salting thing with eggplant and just don’t see the point of it. B. Boggy Creek has wonderful eggplants at this time of year, the sweetest ever! C. Next time you guys are over, I’ll make my Thai red curry eggplant and green beans, so you and I can enjoy it and the conversion of Chris can be continued. D. Damn, I want that sandwich RIGHT NOW! That is very reassuring to know, Diane! Your curry sounds yummy. First time trying and Egg plant. Did same as you up to the frying it was over and eat it like that. 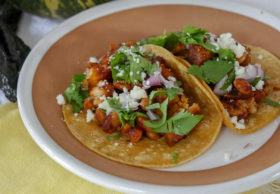 I’m on this recipe tonight ! Got My Eggpalnts with the tiny areolas, got my Dogfish and may San Marzanos for the sauce. Hope yer well Kiddo !! ..and BTW how about a playlist ? To cook with of course.